the high-speed gate or as a retrofit second gate. Windproof, energy saving. The investment pays back quickly. 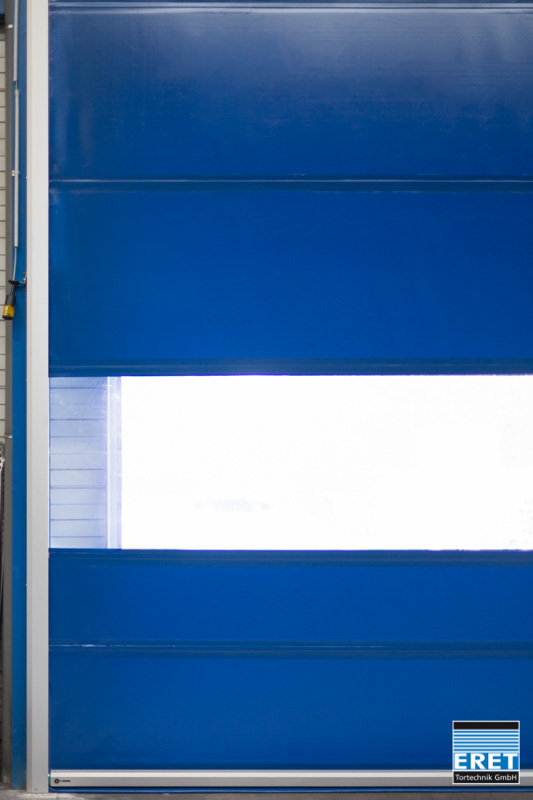 Fast door opening saves time and reduces energy costs for heating or cooling. Your employees are sick less often, because the jobs are protected in the door area from drafts. The costs of operating the gate are minimal. The ideal goal for indoor or addition to an existing exterior door. Solid, self-supporting lateral guide rails.Made of high quality anodized aluminum. Smooth and speedy door travel by Frequenzumwandlertechnik or alternatively with a cheap motor switched directly. optional with electroless Emergency opening by wear-free counterweights. Very simply replacing the Rolltorbehanges. On request we can Wech same slopes for summer and winter. High wind resistance according to DIN. Rails made ​​of high-density PE allow a virtually wear-free door travel. 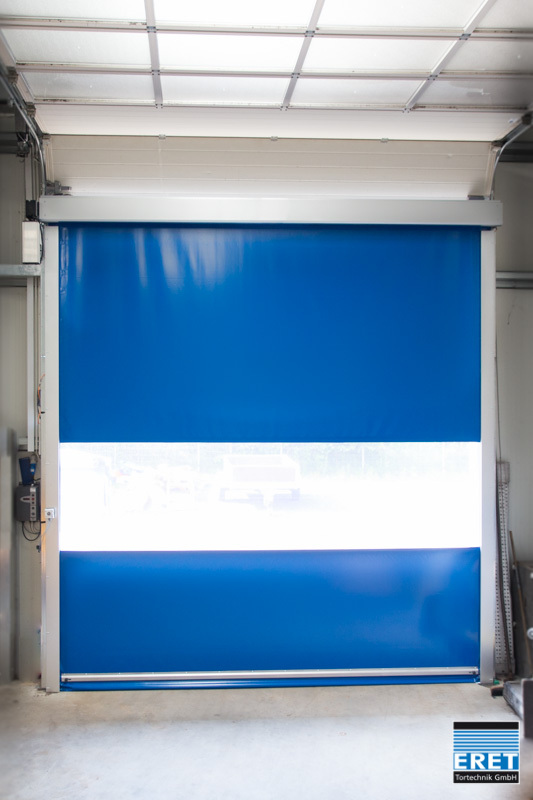 High security with integrated light curtain within the side panels from the ground up to 2.5 m door height. Delivery in all RAL colors. Standard large-size window of approximately 1.3 to 2.2 m height over entire width of the door. The easy-to-install side frames consisting of anodized aluminum to be painted according to requirements made ​​(for the food industry) or stainless steel. Frequently, however, the anodizing is already sufficient. It is driven by a gear motor that is connected directly to the winding shaft. Counterweights, which are optionally arranged laterally adjacent to a frame supporting the drive motor, while ensuring the weight balance of the gate. How can open automatically when the power fails goal. The door curtain is made ​​of highly tear-resistant PES fabric, PVC coated and mounted at eye level, large viewing window to full width of the door. Goals of the L and M series can dispense entirely with wind locks. This results in a virtually noiseless door travel. 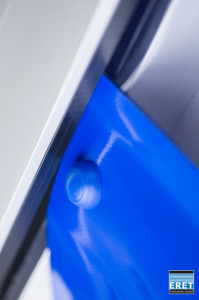 For doors of the S series an extremely flat wind protection is installed in the door panels are covered. However, the noise level is extremely low. 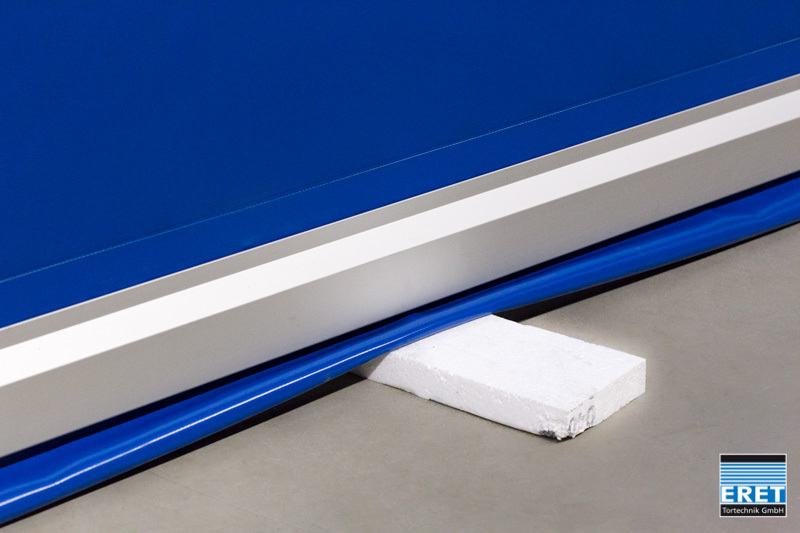 All flexible high-speed doors PSE come standard with anti-crash to the bottom rail. Optionally, can be used with fixing screw for easier provision of larger goals and a manual reset. In this case, the flexible crash pieces can be drawn into the lower part and then fixed again.With less wind loaded outside the door curtain can also be equipped with wind buttons. The control with frequency allows a smooth and quick start of the door and a smooth entry into the final position. By using this drive can be, depending on the requirements of the door opening and closing speeds to program. The control system is designed so that it can be extended without problems, eg locks, traffic light control or for connection to on-site systems and controls. Operating and fault messages can be read with a text display on the control box. In case of power failure, the door can be opened with an emergency hand crank or emergency hand chain. On request: emergency release automatically or via Bowden cable from the inside. Light grid with 2.5 m height detection. 3D laser scanner, advance protection, occupancy sensors or induction loops. Operation by push buttons, pull switches, photoelectric sensors, motion sensors, inductive loops or radio remote control, etc. Guide pillars to open by screws. These are general manufacturer’s instructions. In the individual case, the information in the offer are authentic.